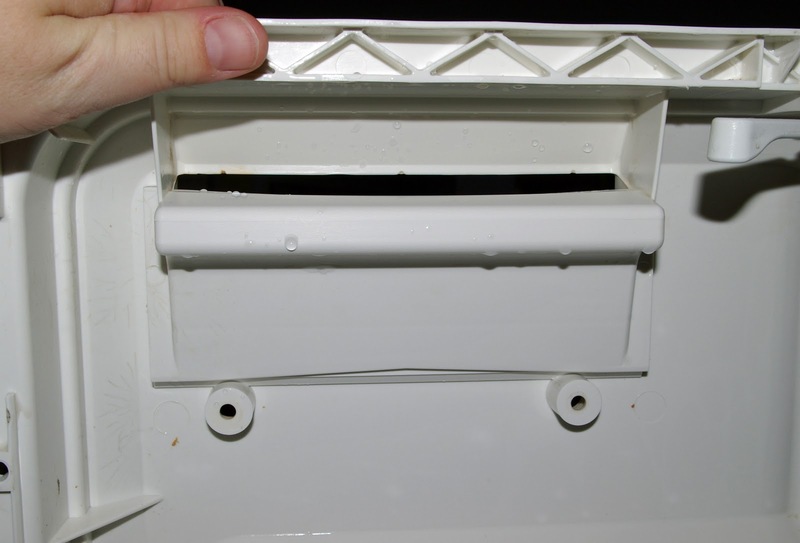 I have also noticed some n@sty-looking stuff building up in the corners of the bottom of the dishwasher, near the door, and have tried to (gag!) scrape it out to see if that would help. 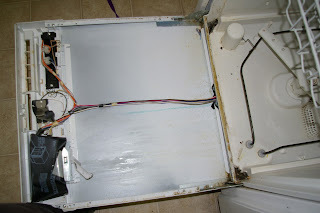 I didn't take any pictures of the dishwasher before I took the door off because I didn't realize that this was going to end up being one of those things I was going to write a blog post about in order to make myself finish the unpleasant job. 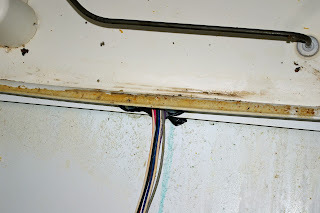 I had taken the inside of the door off once before, when I had been pouring rinse aid into the rinse aid spot and suddenly noticed it coming out of the sides of the door (I figured that I should make sure that nothing electric was wet). It had been a simple matter of taking out the screws located near the edges of the door, and, unlike the vacuum cleaner, there were no wires anywhere that kept the top of the door from coming all of the way off. I recommend doing this job BEFORE you bathe for the day because you are likely going to want a bleach bath to bathe thoroughly as soon as you are finished if you can resist the urge to burn every dish in your house because you just cannot see how they could possibly be clean after what you have seen in the inside of the dishwasher. Upon further reflection, it would have also been a good idea to wear gloves (the stuff I was scraping out was VILE the disinfecting wipes dried my hands out quite a bit). Here come the pictures! Avert your eyes now if you are like me and would rather live in blissful ignorance or denial really don't want to know what could be in your dishwasher. This is what it looked like AFTER I had finished cleaning. In this picture, you can see some of the screws around the edges. 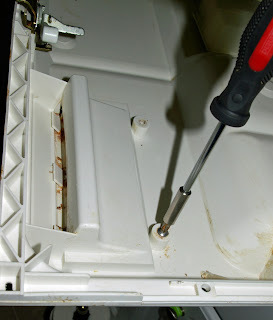 I took those screws out, then took off the plastic part of the door that is inside the dishwasher when the door is closed. This is what the door looks like with the plastic part removed. You can see a hint of the n@stiness to come at the bottom of the door. I actually had to SCRAPE that stuff off; I suppose some sort of wire brush would have worked, but it probably would've taken the paint off also, so I used fingernail-buried-in-a-cleaning-wipe. This is the plastic part I took off; looks pretty harmless, doesn't it? NOTE: this stuff looks SO DISGUSTING, and I don't want to know am not quite sure what exactly it was, but "sludge" and "gunk" were the words that came to mind when I first saw it. This part was A BEAR to clean because I couldn't easily get it in the sink AND it required a lot of scraping and scrubbing. I suppose it would have been easier to clean in the bathtub, but then I wouldn't have been able to see what the demolition experts children were doing. This was, BY FAR, the n@stiest thing to clean. I became suspicious when I carefully removed a piece of Styrofoam near the vent and saw this. Silly me! I thought the part I was unscrewing was going to come off; not the bottom! 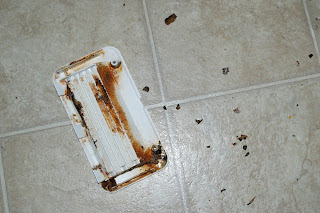 And what is all of that disgusting stuff that got knocked off of the vent cover when it hit the floor?! STEAM! I thought STEAM went through this vent! 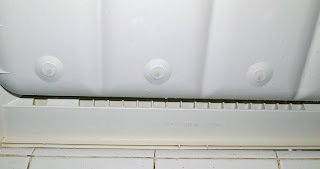 This is what it looked like BEHIND the vent cover, on the door. This part wasn't too hard to clean. 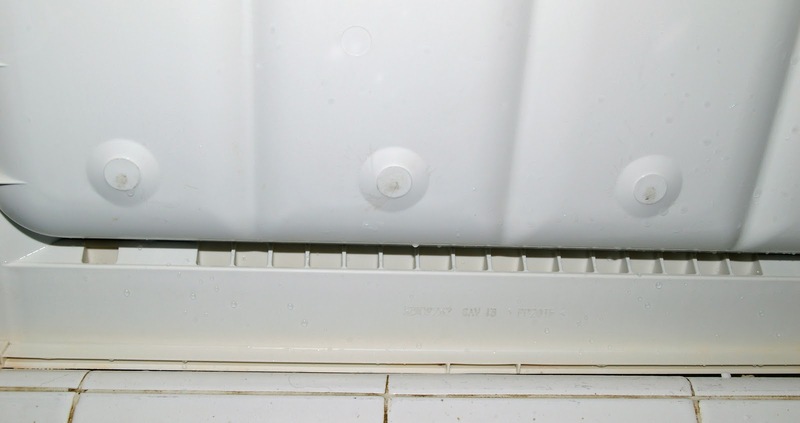 This part was VERY easy to clean since it conveniently fit in the sink. Honestly? I just don't know if I will ever be able to make myself do that again, so I should probably start saving money for a new dishwasher RIGHT NOW! Oh my gosh, that is so gross! (Though to be fair, you warned us!) 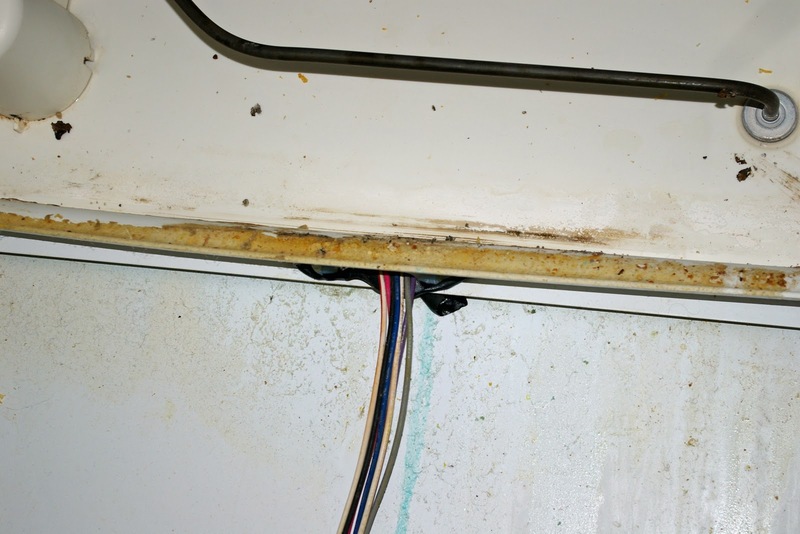 The dishwasher in the house we rent is a piece of crap (even if you scrub the dishes before putting them in the washer, if you don't leave huge spaces around everything, they end up dirtier than when they went in!) and it does stink sometimes (though mostly it's just always a mess). I really want to take it apart, now, and see if things get cleaner afterwards! Did you notice anything like that when you got everything assembled? ACK! I had to enlarge your pictures, because I am an absolute glutton for that sort of thing. I would assume there is some black mildew growing in there, just because it's wet all the time, but I don't even UNDERSTAND what some of that other stuff was. I am very much in awe of you right now. Also kinda glad I don't have a dishwasher. I have to be honest and say I skipped through this. I thought I'd try to read but my fast glances at the pics made me fear I'd never go near my kitchen again. I'm such a wussy. You, however, are either really really brave or incredibly stupid. Carolyn--Our dishwasher is the basic, cheap model that was put in when the house was built. I *think* the dishes are coming out cleaner; I'm not the person who puts away the clean dishes, and I haven't had time to examine them, but I haven't noticed as many glasses with stuff stuck to them. Also, I know that dishwashers have some sort of filter(s) that can be checked/cleaned, but I can't figure out how to get the filter on ours out to clean it; you might check if your filter comes out. And if you have a garbage disposal in your sink, if you make sure it has been run/cleaned out, that can help too. Or just MOVE; it might be easier ;-). 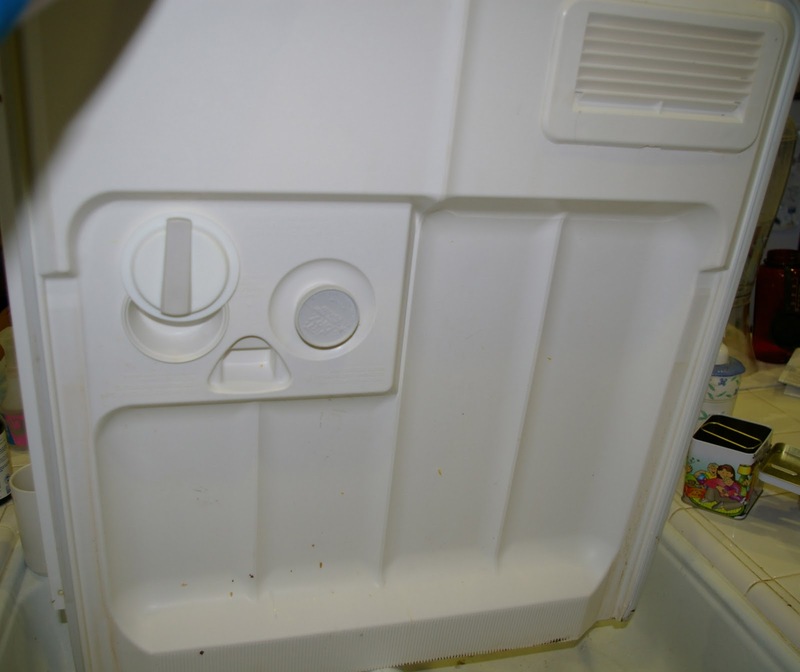 josefinalouise--I'm still torn between being APPALLED at what was in the dishwasher and GRATEFUL that we have one because I might never cook again if I had to wash all of the dishes by hand (or make someone else do it). Mrs. Irritation--I'm afraid it's a toss-up at this point; I blame it on the children either way ;-). You weren't lying. That was disgusting. Our dishwasher is something like 17 years old, and I'm sure it's never been deep cleaned. I feel like I need to do that now, but I'm also terrified of what I'll find. Emily--I would be curious to know what yours looks like, if you end up taking it apart. 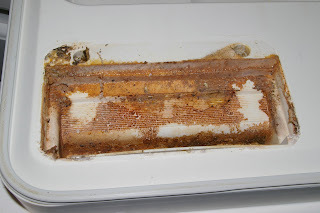 I'm trying not to think of what our first dishwasher (located in 50-year-old housing) would have looked like if I had thought to deep clean it! 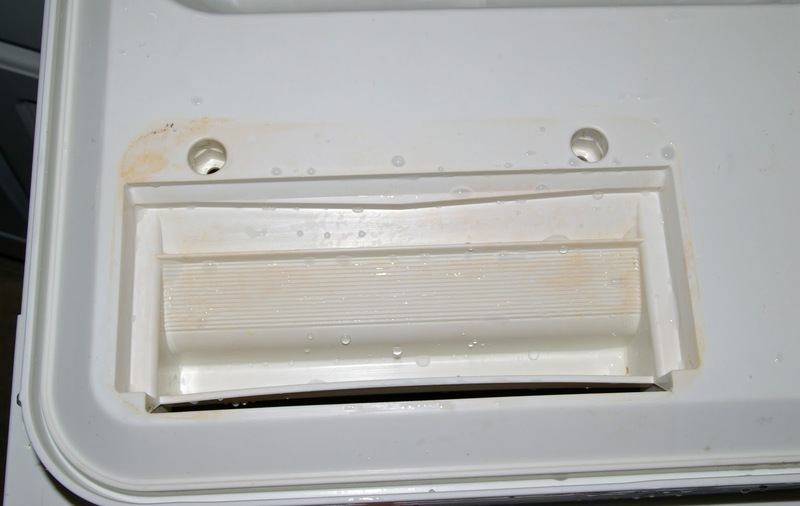 Cleaned my dishwasher today .. it was disgusting. Using bleach solution. Used an old toothbrush .. did as much scrubbing as possible. It is so much better ... But wow the filth was extreme. Anonymous--I am curious to see what mine would look like if I took it apart again, but I'm also VERY RELUCTANT to do that because it was so nasty, and it's discouraging to think that it might look like that again already. I wonder if it is a design flaw or something that is mostly a problem with the cheap/basic models that come with most houses? It's too bad I can't buy a really nice dishwasher for research purposes ;-)! 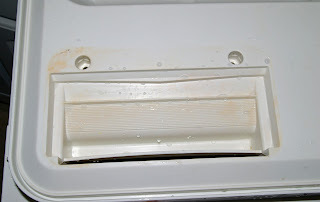 I have used lemonade cool aid to clean my dishwasher and I worked so well that I won’t let my kids drink it!! THANK YOU for the detailed instructions on how to clean the innerds of the door! I just got done cleaning the little grate that filters the big chunks of food from the drain and OH MY! Your comments about wanting to throw out all your dishes because you can never think of them as clean again are spot on! 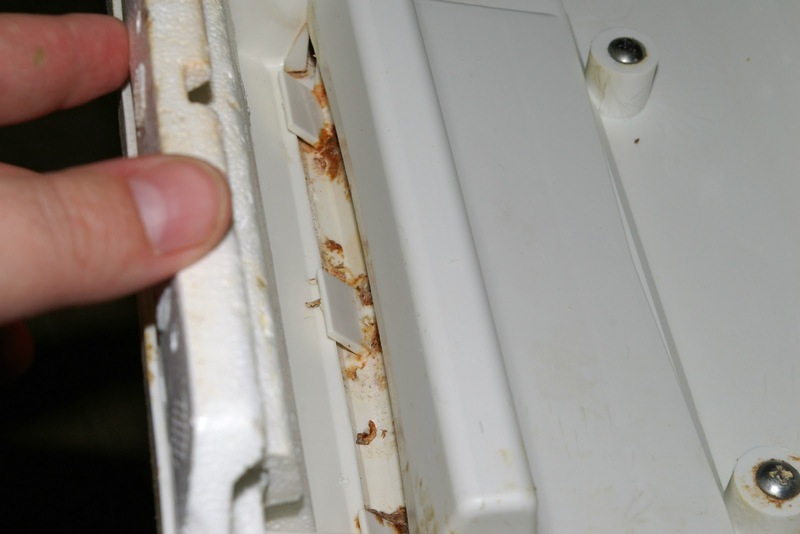 Mold galore. Black mold, grey mold, fuzzy mold. It was coming off in 1 inch chunks! I'm pretty sure I cleaned off about 3x that thing's weight in mold. It was heavy when I pulled it out of the dishwasher and put it in the sink but it's fairly light now! Your dishwasher looks a lot like mine so I'm excited to do the door! You think that's gross, and it's just the door. 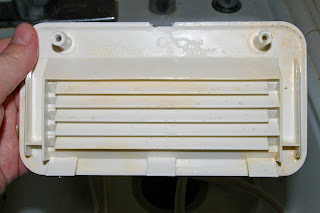 Try taking the pump/impeller assembly apart (the thing that all your "clean" water is piped through), and you just might never use a dishwasher again! 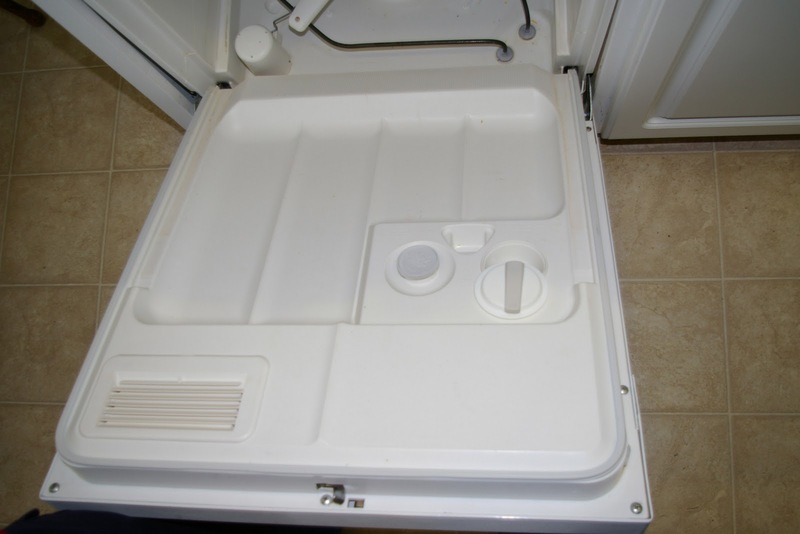 This is our exact dishwasher! Luckily we got to it before it was quite so stanked up. 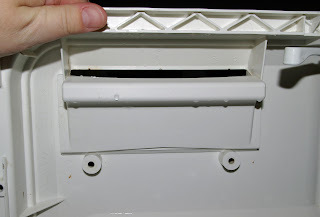 We have a hand-held bidet sprayer in the shower that we use for diapers, and I used that to delouse the door panel. I just noticed all the crud around the edges of my DW and looked at all of the info on the web. Your information is the ONLY site I found that dug (pun intended) that deep and gave all the gross details. Anonymous 7-12-14: Well, it started as a stress-cleaning job but quickly turned into an "if I don't turn this into a blog post, I don't think I'll be able to make myself finish because this is NASTY" job, so it's nice to know that blogging about it was helpful for others =)! So, did it get rid of the smell? Anonymous 7-28-15: Yes, it did! So glad I saw your blog post about this. I just moved into an apartment for the first time. When I got here the dishwasher just filled with water, didn't drain, leaked from the sides, and had suds coming out of the front. Somehow maintenance fixed it within 25 which didn't make any sense to me. My roommate scrubbed the inside where the water had been sitting for a while but I was suspicious that a more thorough clean was in order. I found this article and got scared. I was pleasantly surprised that we have the same washer and could compare. It was gross. Certainly not as bad as yours. But gross. 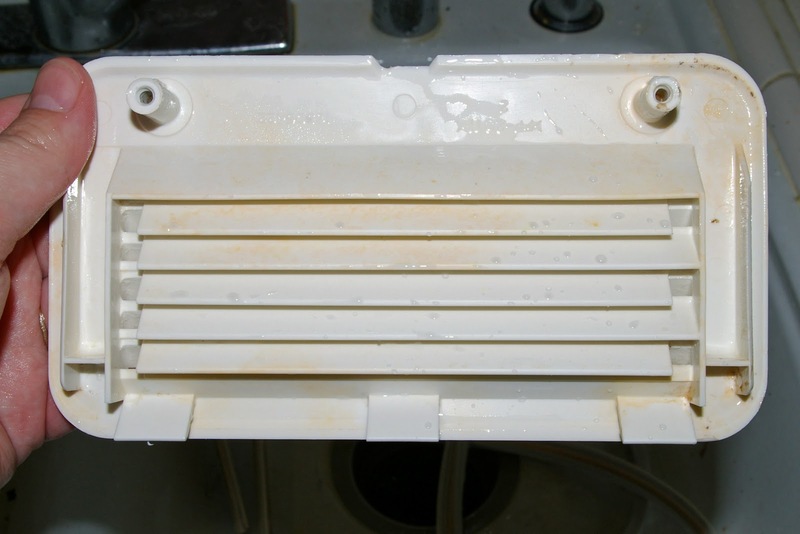 I think I dertermined that most of the buildup--which was either gray or spots of black--was from hard water and lots and lots of soap scum. It was still a 2.5-3 hour job after all said and done. It was a foul job but I have to echo the satisfaction of the job, so glad it got done. I'll feel better trusting my plates and dishes to it! Thanks for the inspiration! !